Dimension Films Acquires ‘Wild Oats’!!! 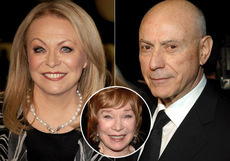 Dimension Films continues its acquisitions streak with the pick up of the road-trip comedy WILD OATS featuring a talented cast including Academy Award® winner Shirley MacLaine, Academy Award® nominee Jacki Weaver and Academy Award® winner Alan Arkin . The film is directed by Howard Deutch who helmed the classics PRETTY IN PINK and SOME KIND OF WONDERFUL, and recently worked at HBO directing shows such as BIG LOVE and HUNG. Claudia Myers and Gary Kanew penned the script which has been described as a spunky comedy that is a cross between SIDEWAYS and THELMA AND LOUISE. This entry was posted on Monday, April 9th, 2012 at 4:54 pm	and is filed under Film, News. You can follow any responses to this entry through the RSS 2.0 feed. You can skip to the end and leave a response. Pinging is currently not allowed. « The Ultimate Zombie Movie Guide!!! In Honor of Zombie Jesus Day!! !